With 12 months No Interest, No Payments & No Money Down! At Dreamstyle Remodeling, we have been fulfilling the home improvement dreams of customers since 1989 and have earned a reputation for offering premium products and exceptional installation. That’s why, in addition to holding an A+ rating from the Better Business Bureau, we are also America’s #1 Remodeler, as ranked by Remodeling Magazine. 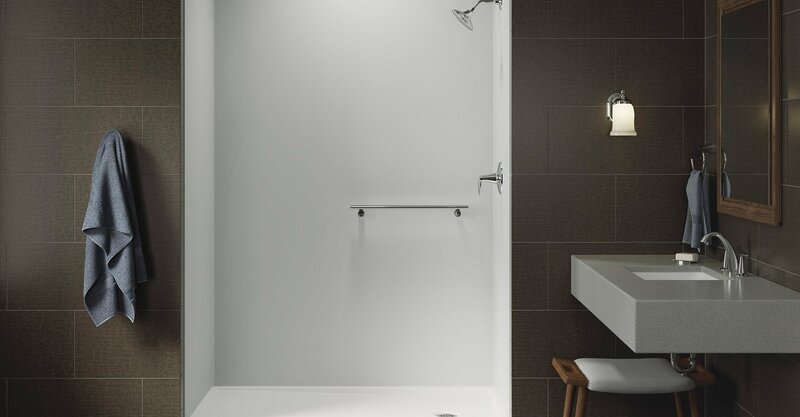 For homeowners who need a more organized showering space that provides the utmost in beauty and functionality, Dreamstyle Remodeling is proud to offer and install the Choreograph™ shower wall and accessory collection by the world-renowned manufacturer Kohler. Made from Kohler’s tough proprietary material Serica™, the Choreograph system is built to deliver many years of style and performance. This shower system also comes with several customization options, but no matter which you select, our team of experts will ensure that you get the most out of your new shower. Our dedication to customer satisfaction is shown in every step of the installation process. Our design consultants will work closely with you to make sure that all of your preferred shower system options are included in the final design. This means you’ll be able to make changes long before the installation begins. So, if you want a bigger Shower Locker® for more storage space, or if you realize you prefer wall panels that are boldly textured instead of smooth, we can easily accommodate you. Because you’ll see how each change affects the look of your new shower system, you will be spared surprises and disappointments with the finished project. With more than 60,000 home renovations completed since our founding in 1989, we know that products are only as good as their installation. That’s why we rely only on our extensively trained and experienced technicians for our shower system installations. You can feel confident that your shower remodel is in capable hands. We have a dedicated customer service department that will promptly address any questions or concerns you may have about your Choreograph system once we’ve finished installation. And, to give you even more peace of mind, we back our shower system installations with a generous workmanship warranty. To get started on your new shower system installation, or for more information about our installation process, contact Dreamstyle Remodeling today and schedule an at-home consultation. Also, please ask about the convenient financing options we offer to qualified homeowners throughout the Western United States. $1000 OFF Complete Shower System! — With 12 months No Interest, No Payments & No Money Down!